Brexit is still putting pressure on EUR against the USD. 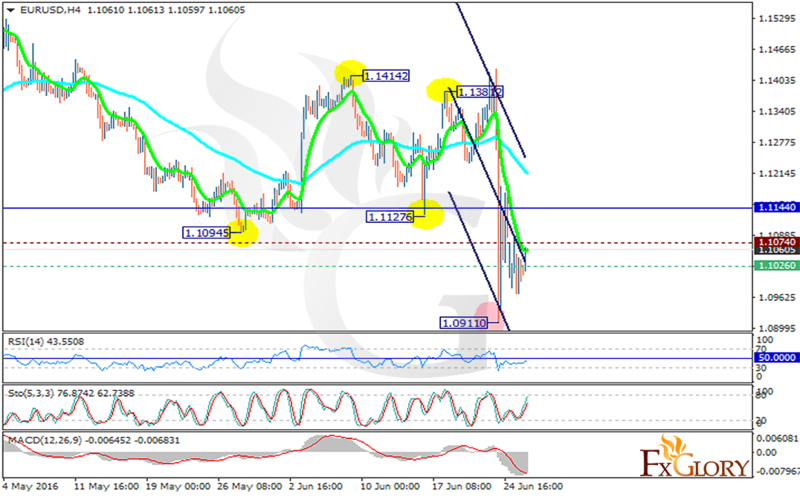 EURUSD has been moving in lower ranges after the UK referendum and despite the bulls’ effort to push the price up; the pullbacks dragged the pair down. The support rests at 1.10260 with resistance at 1.10740 which both lines are below the weekly pivot point at 1.11440. The EMA of 10 is falling sharply below the EMA of 75 indicating the current sudden price decline. The RSI after passing the oversold area is getting closer to the 50 level, the Stochastic is showing upward momentum and the MACD indicator is in negative territory showing the price fall. The resistance level breakout can be considered as a good signal for buyers however further decline is expected with the target at 1.0900.